Scenario outline basically replaces variable/keywords with the value from the table. Each row in the table is considered to be a scenario. Let’s continue with the same example of Facebook login feature. So far we have been executing one scenario: Upon providing the correct user name, login is successful. Now, suppose we want to check if login is successful for all three possible types of inputs, which are username, email address, or phone number. To achieve this, we will need to write three different scenarios, where each scenario will vary with the type of input, login is successful. In this case, scenarios will look like the following. Here, if we see closely, for above three scenarios: statements are the same, only the input parameter (username/email address/phone number) is changing. That’s where the importance of scenario outline comes into picture. When we define any scenario with scenario outline, we can specify one test scenario and at the bottom of it we can provide a number of inputs. The scenario will get executed as many times as the number of inputs provided. Add dependency for Cucumber-Java: This will indicate Maven, which Cucumber files are to be downloaded from the central repository to the local repository. Add dependency for JUnit - This will indicate Maven, which JUnit files are to be downloaded from the central repository to the local repository. Note − In the above code, we have to define a function having two input argument: one username and other will be for password. So for each set of input provided in the example tag, Set of GIVEN, WHEN and THEN will be executed. 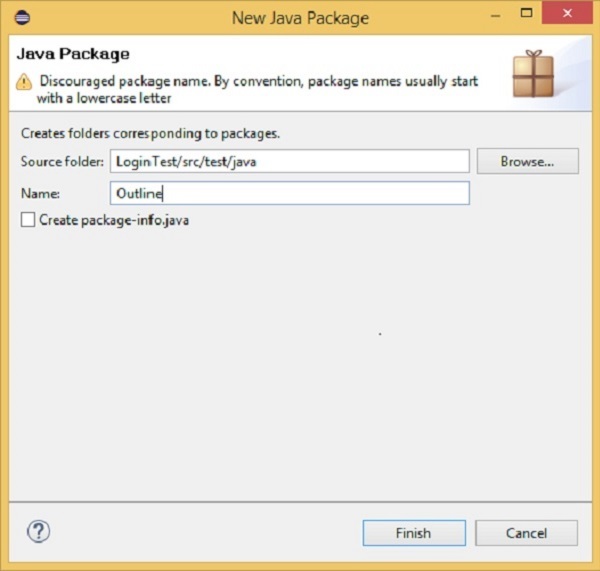 Select runTest.java file from package explorer. Right-click and select the option ‘Run as’. Username1 and password1 will be passed as an input to username and password field. In the console, you will see “Test Pass” printed. Step result 1 to 5 will be re-executed for username2 and password2. In nutshell, when scenario does not change but only the data value gets changed, it is advisable to use scenario outline data tables.